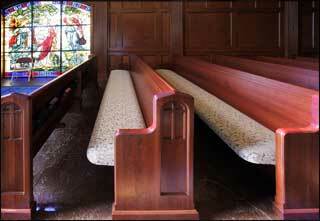 Church Pews Designed To Be Durable And Attractive. go to our MAIN SITE ratiganschottler.com.Click this link or main site button. Pews are built with a strong belief in using superior materials, combined with outstanding craftsmanship, to produce furniture of outstanding quality. Ratigan-Schottler's oak pews are designed to last for generations, while still retaining their inherent beauty. All of our products are made using the finest Northern grown, solid red oak. Other hardwoods such as maple, cherry, walnut and mahogany are available upon request. 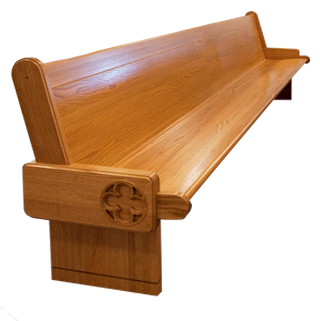 We offer colonial, contemporary, cantilever, open-end and traditional pew end designs. The body to each pew can include either a contoured hardwood seat or an upholstered seat. No matter what style you choose, all of our pews come standard with continuous, solid oak bookracks and solid oak end / center supports. 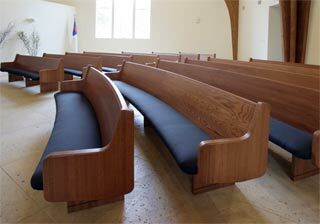 Our designers can also work with you to create church seating that reflects the style and atmosphere of your church. Nothing is off-limits with a custom-designed pew. Some of our many services include hand carving, combining different woods and including special inserts or stain colors. All of our regular pew designs can also be modified to suit your preferences. 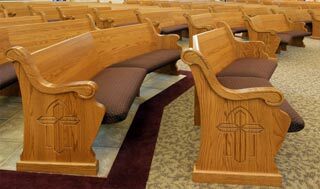 If you require kneelers on your pews, many options are available including both solid hardwood or aluminum fold-up kneelers. Backed by over 7 decades of experience, our craftsmen incorporate quality into all of our church pews, no matter how simple or how elaborate the design. To find out more about our services or to receive a product catalog, we welcome you to contact us at 800-383-1000. One of our experienced agents will be happy to assist you and answer any questions that you may have. Please ask us about pew refinishing and restoration services. 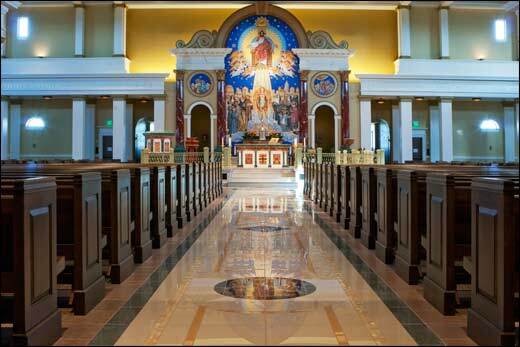 St. Michael the Archangel in Leawood, KS. Solid oak mitered pews. First United Methodist Church in Round Rock, TX.